Fund Shopping this Holiday Season? Research and Compare. 'Tis the season to shop—and smart shoppers know it makes sense to compare prices on the same or similar items before making a purchase online or at a store. Smart investors know that comparison shopping for financial products such as mutual funds and exchange-traded funds (ETFs) should also be on your holiday checklist. Just in time for end-of-year fund shopping, the Financial Industry Regulatory Authority (FINRA) has introduced a new and improved Fund Analyzer tool. It can help you understand the impact of fees and potential discounts on mutual funds, ETFs, exchange-traded notes and money market funds. "While stocks and mutual funds are the most commonly held types of investments, other types of investments such as ETFs are less widely owned," said Gerri Walsh, FINRA's Senior Vice President for Investor Education. "The Fund Analyzer tool can help investors make more informed choices. None of us can control future fund performance, but we can control our costs. A one percent difference in fees can add up to tens of thousands of dollars over 20 years." The Fund Analyzer's live data feed allows you to sort through and compare more than 30,000 products and run a wide variety of investment scenarios. The tool also enables you to calculate how a fund's fees, expenses and discounts impact the value of a fund over time. "The enhanced design allows investors to better determine which funds might meet their investing needs at the lowest cost while providing the best value," Walsh said. "We have also added advanced features that allow the tool to model typical investor behaviors and to illustrate the impact that wrap accounts or flat fees can have on overall costs as well as future account value when holding mutual funds." 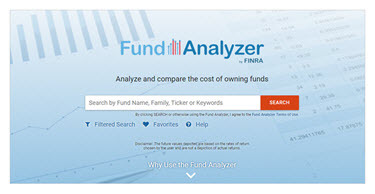 The Fund Analyzer is easy to use. Just select up to three funds to compare, the amount of money you plan to invest and how long you plan to keep the fund. The Fund Analyzer does the math for you—and shows how fees and expenses influence the value of your fund over time. An innovative display that helps visualize how a fund's annual operating expenses compare to their product and share class peers. Common discounts, such as Rights of Accumulation and Letters of Intent, which can be modeled to create a more precise analysis for investors who take advantage of these discounts. Advanced features that allow analysis of new and emerging share classes with variable and firm-specific fee scenarios. Fund-by-fund details regarding potential discounts funds may offer to investors. Data on a fund's past performance, including how the process behind Morningstar ratings and access to important fund documentation. The earlier version of Fund Analyzer tool is still available on FINRA's website until February 1, 2018. In the coming months, FINRA also plans to feature instructional videos to help investors better understand the Fund Analyzer's more advanced features and data analyses functions.